A phone call from my neighbour today, made me grab my camera and run. 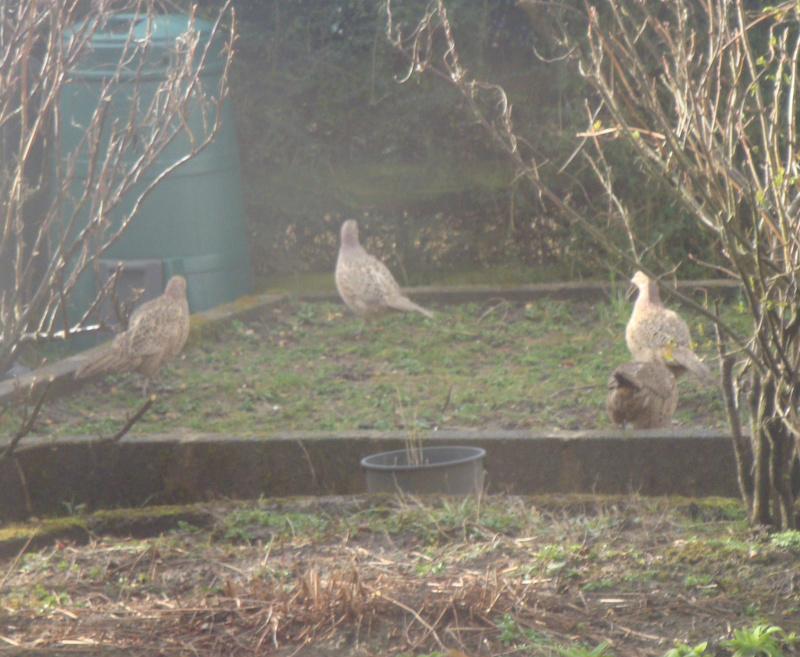 You see, in her garden were six pheasants...all female. I knew instantly that they were girls, due to their dull colour. The males are much more attractive with a golden plumage. ‘’I thought you’d be interested,’ she said excitedly. And I was. But I was also a wee bit concerned, as I know that these girls were bred to be hunted. I was in the shed and suddenly heard, what appeared to be explosive noises! Oh my God, they are shooting the pheasants!!!!!! Then I listened more carefully and realised it was your dear and unassuming husband chopping wood. Oh the relief. You make a relationship with a pheasant when you feed it! I have to say I laughed. My dear and unassuming husband was totally unaware of the anxiety he had caused and I laughed again at the realisation that my neighbours are also reading about the daily goings on at our home for waifs and strays. As for the dear pheasants, perhaps I ought to put up a sign saying, this way to safety!